Cooking Crave™: Homemade Pizza Again!!! Hohoho~ I bake PIZZA for brunch (breakfast + lunch). Friday and Saturday are school holidays for those who stay in Alor Star and Perlis state. Normally, we (my kids + me) will wake up late and skipped our breakfast on that day. I wake up around 9am, not too late actually and got my laundry done and clean my house. 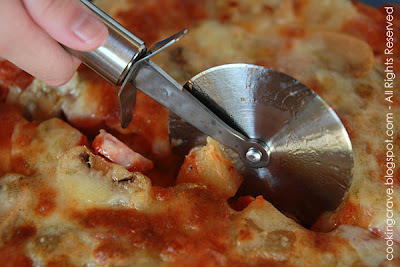 Since it has been quite sometime that we last eat PIZZA and I decided to bake PIZZA for our brunch. I don't have to ask my kids about this as they sure LOVE IT!! This time round I bake the pizza crust using just plain flour and wholemeal flour. 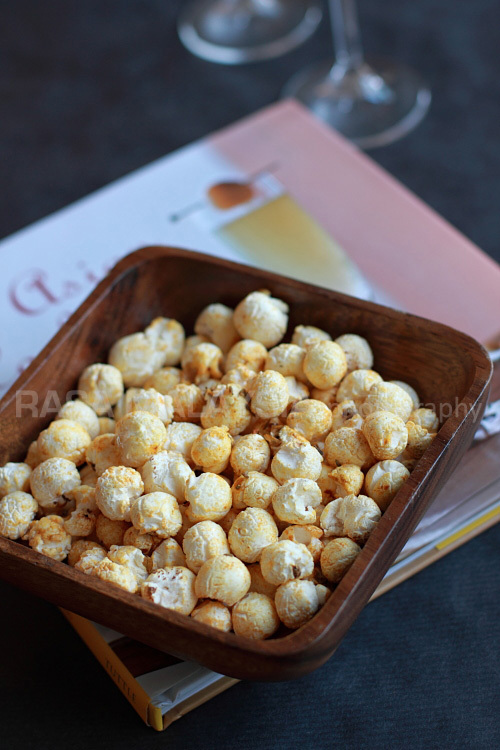 Surprisingly, it turn out very yummy. 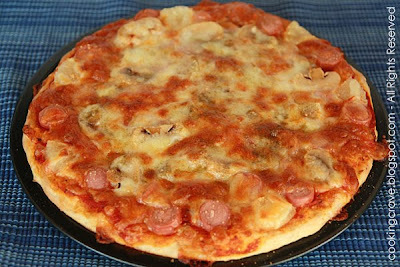 I make two 10" pan pizza with sausage, mushrooms & canned pineapple as its topping (*sound boring right? ?, but these are my kid's favourite). I sprinkles it with a lot of parmesan & mozarella cheese. I LOVE CHEESE!! My newly bought pizza cutter. Very convinient when cut the hot pizza. Mix plain flour, wholemeat flour and yeast in a bowl. Add in sugar, salt and set aside. In another smaller bowl mix milk, water and olive oil. Pour it to the flour mixture slowly bit by bit and stir till it's well combined. The dough will be sticky at this time. In a flat surface, dust your hand with some flour and slightly knead the dough for 2-3 minutes until it can forms a ball. 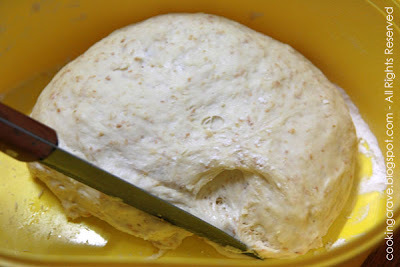 Place the dough in a greased bowl, cover it with cling film and let it rest for 20 minutes. Remove the cling cover from the dough and punch the dough down so it deflates a bit. Split the dough into 2 and roll it to the 10" round piece. Let the dough rest for 5 mins and brush it with some olive oil before we top it with topping. **You can refer to my previous PIZZA post for the topping idea. We can actually top it with any of our favourite toppings - onions, tomatoes, tuna fish, prawns, bacon, ham, etc... The sauce for pizza also plays the important roles in PIZZA making, make sure you get the right and yummy sauce and don't forget to add a lot of cheese on it. great !! use wholemeal flour look more healthy!! So nice to have homemade pizza at home. I usually buy the ready packed pizza crust and let the kids do the topping. Will try this recipe. Thanks for sharing. Ya, i like to bake pizza at home too, kids can choose to top with the things they like.Healthy and cheap too. 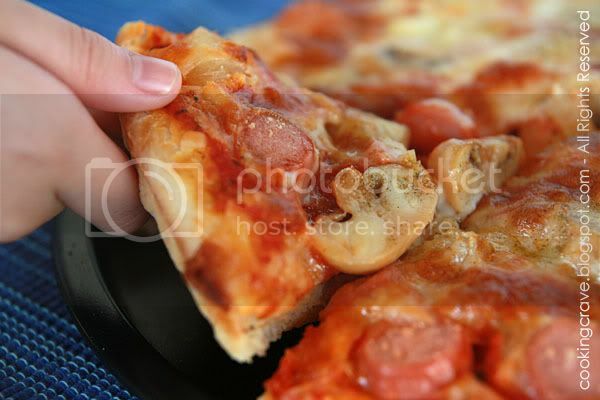 I would hardly resist for having this nice piece of pizza! I like your pizza dough with some wholemeal flour, that's much healthier.. I'll definately try the dough recipe next time. Thanks for sharing! I am so craving pizza now! I love the title pic!